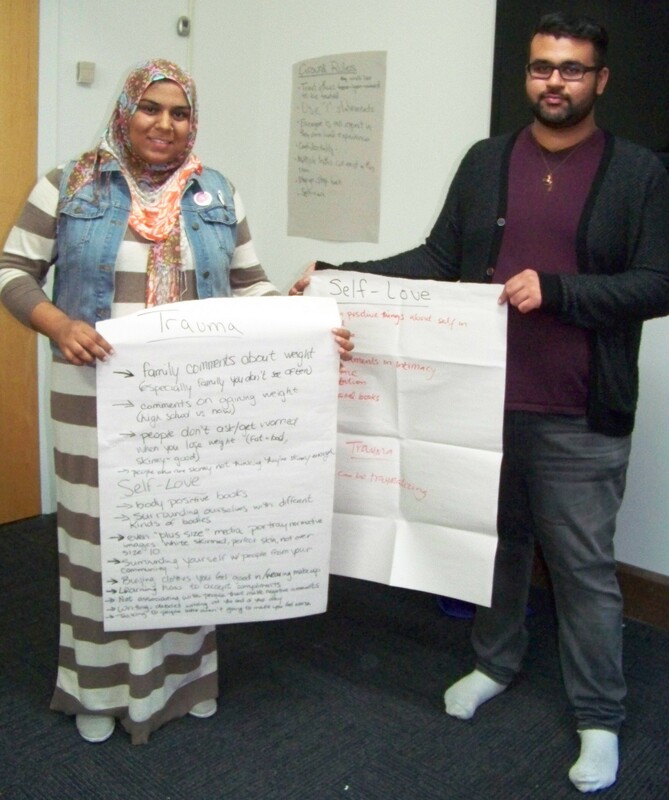 September 2013 saw Ryerson University Student Union put on Xpressions Against Oppression Week. 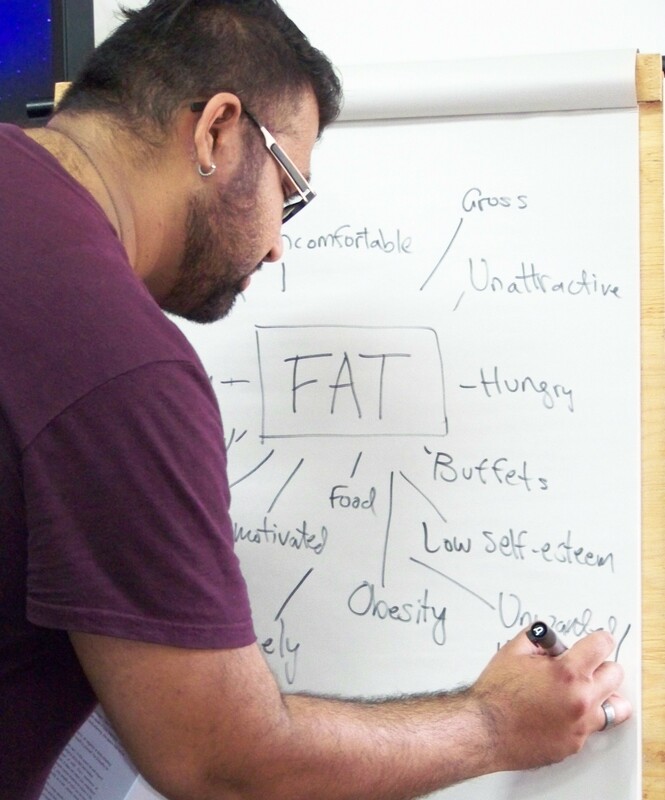 One of the workshops was It Gets Fatter facilitated by Sara M. and Asam Ahmad of the It Gets Fatter project. What does fat mean as [to] a person of colour? Asam mentioned the history of the group It Gets Fatter and their website: It Gets Fatter. He followed by talking about his history of having issues with his body and never seeing himself (a person of colour) represented in talks about fat positivity and combatting fat-phobia; because of this Asam talked of preference given to Indigenous Peoples, People of Colour, and women during the workshop. Half the room was people of colour which had me feeling comfortable. We did a check in to see how people were doing and then a go around to share names and preferred pronouns. Definition of fat phobia that we, the group, came up with: the fear and hatred and fat bodies. * Everyone is an expert in their own lived experience. Example: oppression is not transferable. 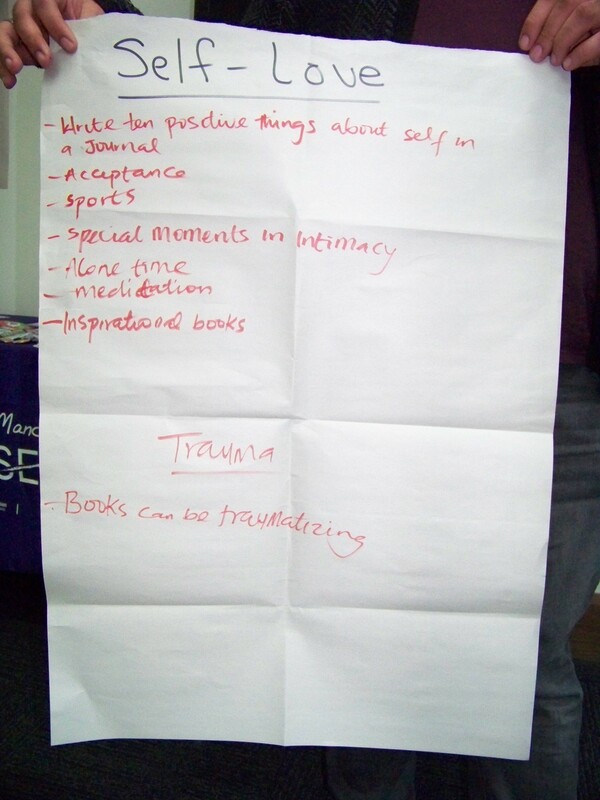 * Confidentiality: what you learn at the workshop can be shared but do not share peoples stories and names. 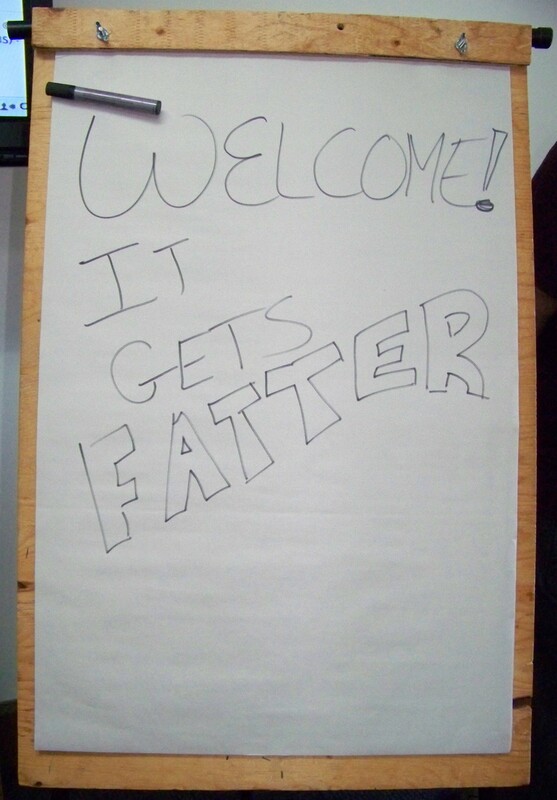 * “It’s important for us [fat peeps] to use that word and reclaim it,” said Asam. He feels strongly about encouraging others to use it if they identify as fat. * Why not celebrate the way we are and the bodies we have right now? * Reminder: “Doctors aren’t God and they work for us…We should be a lot more critical of the medical industry and doctors,” said Sara. * “Research has shown that you can’t know anything about anybody’s health by just looking at them,” said Sara. * Fat phobia affects everyone: “It’s never just fat people affected by these discourses,” said Sara. Participants sat in two circles talked about what they learned and about two charts written up during the workshop: Self Love chart and Trauma chart. Participants shared their thoughts on the workshop and gave thanks to the organizers and facilitators. 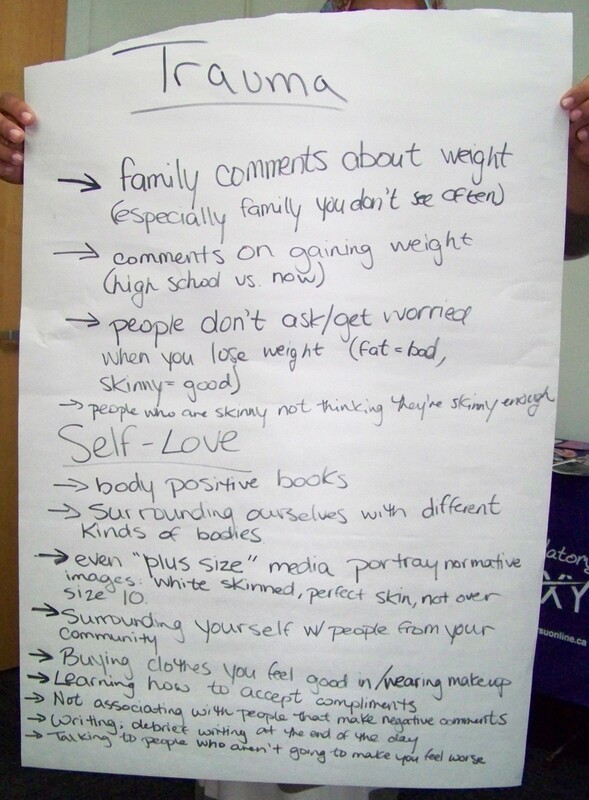 This entry was posted in Uncategorized and tagged Anti Oppression Workshop, Body Positive, Diet Industry, Fat Phobia, Fat Positivity, It Gets Fatter project, It Gets Fatter TUMBLR, Xpression Against Oppression. Bookmark the permalink. I support fat-identified people, but I still have a lot of internalized (and sometimes externalized) fatphobia to work on. Thanks so much for posting such an honest comment. I think we all have to deal with, and work on, internalized and “sometimes externalized” fat phobia. It’s part of our unlearning process.